The largest region in the whole of France, it's not difficult to find a good campsite in the Midi-Pyrénées. Spreading north from the foothills of the Pyrénées, this is a beautiful spot to go camping. Outside of its historical towns and capital of Toulouse the area is rural with idyllic villages including some the famous fortified ‘bastide towns’. There are plenty of great camping options to suit all budgets and needs from glamping to traditional tent-only locations. From the high altitude of the mountains to the great viewing plains of the foothills further north, pitch the tent or pull up the campervan in one of the best campsites in the Ariège department of South West France with this collection of truly special places to camp, all chosen by the travel experts at Cool Camping. 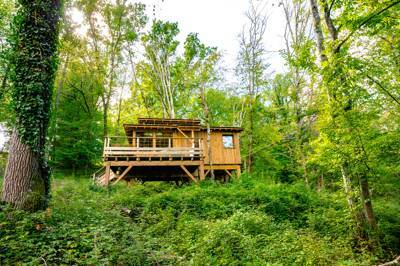 Find the best camping and glamping sites in Aveyron with this collection of campsites unearthed by the authors of the best selling Cool Camping France guidebook. From gypsy caravans to tents, motorhomes to campervans, there’s a camping option to suit you. Remote spots, waterside campsites, woodland camping, we’ve got them all. Better known to Brits as Gascony, the department of Gers is the home of sweeping sunflower fields, glistening lakes and a treasure trove of excellent campsites. From tiny rural hideaways to family-friendly stays, discover the very best campsites to pitch your tent or park the campervan with this hand-picked collection from the travel experts at Cool Camping. 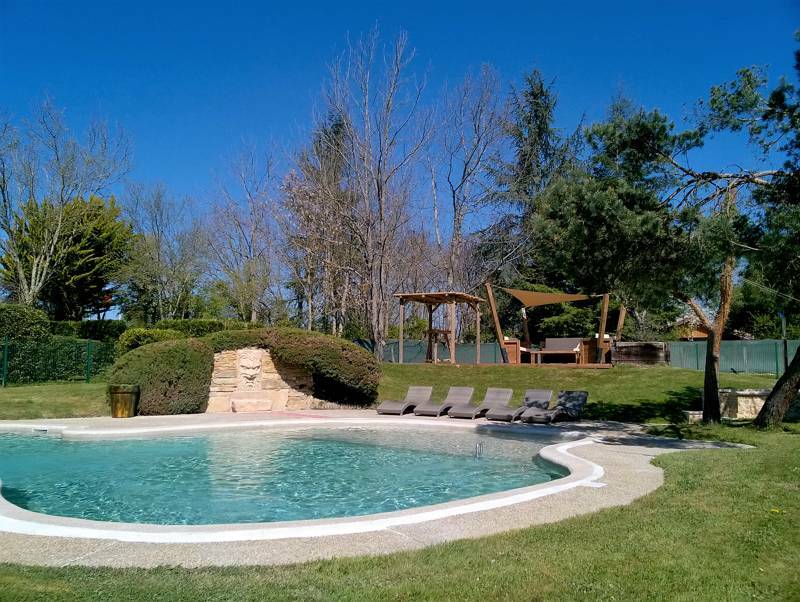 From the crinkling peaks of the Pyrenees to the flatter, agricultural landscape in the north, the Haute-Garonne department is a wonderfully varied land that's ripe for excellent campsites of every kind. 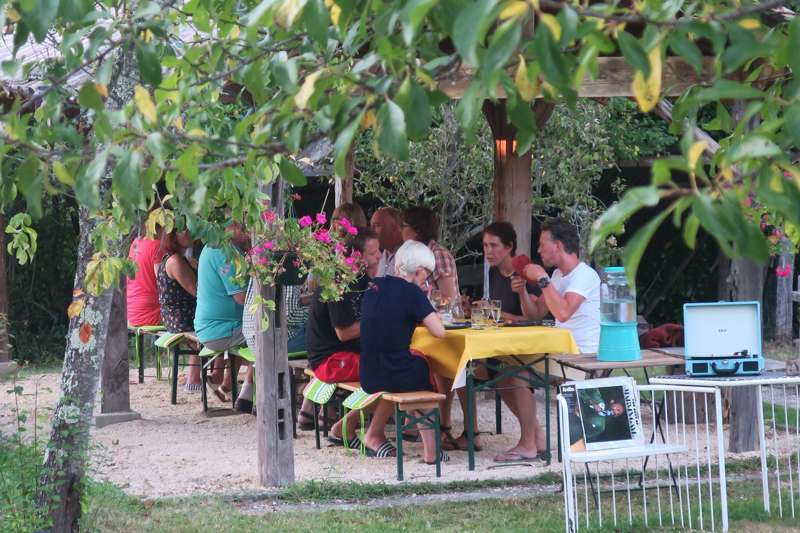 From small, mountain-side spots to spacious, family-friendly campsites, discover the very best places to pitch in the Haute-Garonne department here. 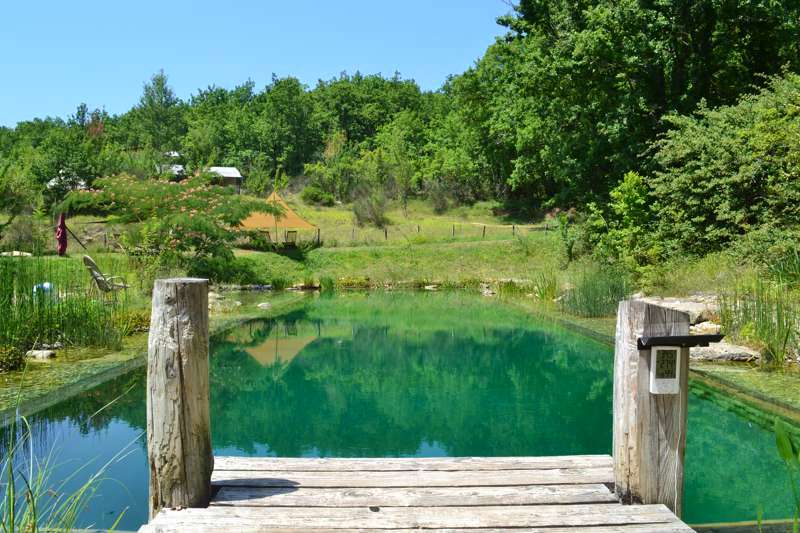 From the wiggling River Lot that gives the department its name, to the wide, green valley of the Dordogne River further north, this lush department in the heart of France is a treasure trove for campers. Pitch your tent in Causses de Quercy Natural Park, park the campervan in a hidden riverside campsite or take the family and enjoy a glamping holiday like no other. Whatever you choose, find the very best campsites in Lot here, all hand-picked by the travel experts at Cool Camping. Whether it's the River Candé in the north or the Aveyron in the south, the lush, green, valley landscape of the Tarn-et-Garonne department owes a lot to the waterways that run through it and lend the place its character and colour. 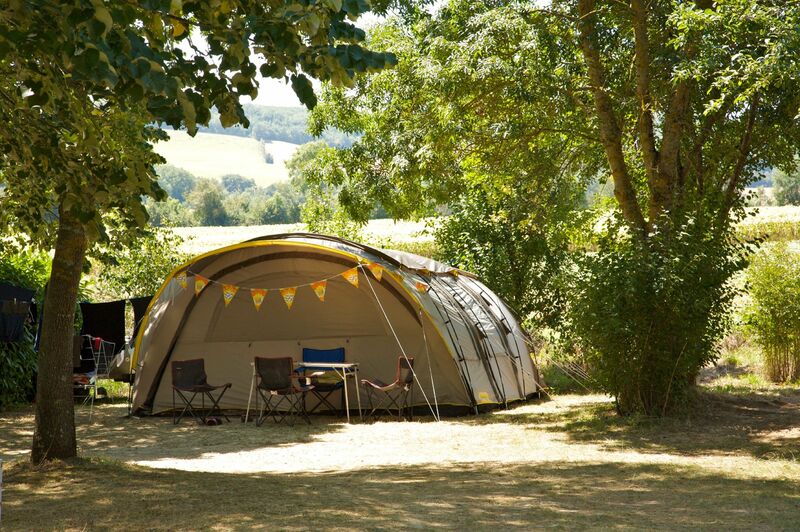 From the riverside to the open countryside, there's a campsite to suit all types in Tarn-et-Garonne and, whether your pitching a big family tent or parking up a tiny campervan, you've come to the right place. 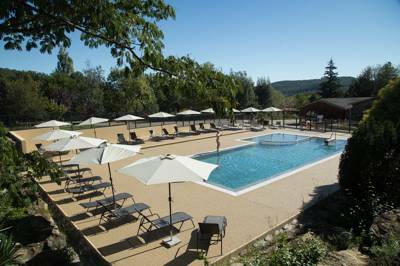 Discover the very best campsites in Tarn-et-Garonne here. Sandwiched between the coastal regions on the Atlantic and the Mediterranean coasts is the Midi Pyrénées, stretching inland from the mountainous Spanish border. And while the mountains that give the region its name may be the star attraction for some, it’s the peaceful waterways, historic villages and general rural bliss that tempt others. The best campsites in the Midi Pyrénées are as varied as the region’s highlights. We’ve looked high in the mountains and down in river valleys to put together the Cool Camping collection. Within it you’ll find places where you can pitch your own tent for a great-value classic camping holiday as well as ultra-luxurious glamping accommodation where comfort and camping combine. There are sites where you can find a secluded glamping hideaway for two and sites where the family-friendly facilities and sociable spaces will make it a hit with the kids. If you’d like to unzip your tent to crisp mountain air ahead of a day of adventure you’ll find somewhere to suit you in the Midi Pyrénées but if you prefer to fling open the doors of a chalet to a woodland view from the veranda, you’ll find it here too. Since 2016 the Midi Pyrénées has been twinned with Languedoc on the south-west Mediterranean coast to form the Occitaine region. Previous to this, Midi Pyrénées was France’s largest region with eight departments (or counties) and a whole lot of variety jostling for attention. The Haute-Pyrénées, Haute-Garonne and Ariege are the most southerly departments of the region – all forming part of the border with Spain. If your idea of a holiday is heading out for a hike, bagging summits or cycling in Tour de France col territory then look out for campsites in these regions. The Pyrenees National Park is a particularly special place – one of just six national parks in the whole of France and a hotspot for wildlife and rare flowers. Neighbouring Néouvielle National Reserve is also protected for its biodiversity: a land of pine forests, lakes and meadows sculpted by glaciers. But it’s not all action in the border counties, you can head to the mountain-top to enjoy the views with minimal effort if you hop aboard the cable car to the Pic du Midi. At 2,877 metres the views across mountains are jaw-dropping. This area of the Midi Pyrénées is also the place to pitch if you fancy a mountain view as a backdrop to breakfast or like the sound of heading to a traditional spa town like Baréges or Ax-les-Thermes. The famous pilgrimage centre at Lourdes, where the Virgin Mary is said to have appeared in 1858, is nestled in the foothills in the Haute-Pyrénées region too. Haute-Garonne is also home to the capital of the Midi Pyrénées region, Toulouse. France’s fourth biggest city, Toulouse is known as the “Ville Rose” or “pink city” thanks to the rose tint of many of its brick buildings. There’s plenty of sights if you fancy a day in the city during your camping or glamping trip with historic buildings, museums and peaceful waterways. The city marks the start of the Canal du Midi, which was dug way back in the time of Louis XIV and is recognised by UNESCO as a feat of 17th-century engineering. Flowing some 150 miles south through Languedoc to the coast, the canal is a peaceful place to cycle, walk and mess about on boats. You can also take to the water in Toulouse on the River Garonne which flows through the city centre. The Garonne is just one of many Midi Pyrénées rivers and along with the Tarn, Lot, Gers and Aveyron gives its name to other departments of the region which are largely rural and more sparsely populated than much of the rest of the country. Sharing much with neighbouring and better-known Dordogne; Gers, Lot and Tarn-et-Garonne are bliss if you are looking for a spot of French camping away from the crowds – the sort of places where you can get away from it all and enjoy peaceful riverside rambles, gentle bike rides and quiet nights. Fields of maize, sunflowers and wheat dominate the landscape with a few vineyards thrown in for good measure – this is France after all. Many of the Gers grapes are not destined for wine at all though but for the region’s most famous export, Armagnac. Aveyron is the easternmost department of the Midi Pyrénées and here it’s the mountains of the Massif Central that loom large. It’s a region of châteaux, bastides or fortified villages and yet more rural beauty. The warm sunshine of the south of France means that it’s the perfect place for classic back-to-basics tent camping. Thousands of Brits and other Europeans make a pilgrimage south for the sun and mild climate of “the Midi” but many head straight to the Med or the Dordogne. If you make an annual pilgrimage to the south of France, how about swapping the beach for the mountains or a spot on a rural riverside retreat? 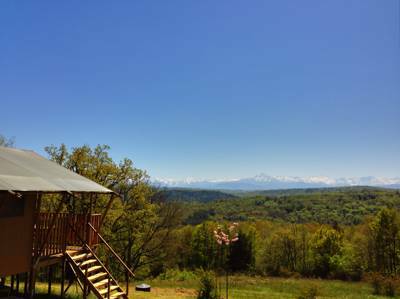 What could be better than pitching your own little home-from-home in glorious Midi Pyrénées scenery whether that’s among those beautiful mountains, next to one of its many meandering rivers or on a country campsite? Camping in a tent means you’re as close to the outdoors as you can possibly get without actually sleeping under the stars. You can smell the pine trees and hear birdsong or the sound of a babbling brook from within your tent and need only to unzip the tent doors to feast your eyes on your surroundings. Taking your own tent is an eco-friendly, sustainable way to holiday in the south of France and it’s usually the best-value way to stay there too. 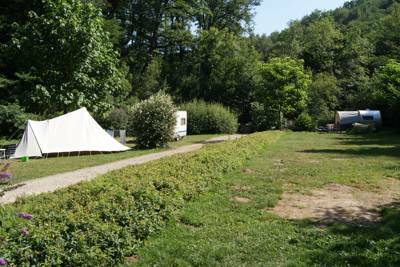 Like most of the South of France, the Midi Pyrénées is well set-up for camping with plenty of top-quality campsites. Here at Cool Camping, we don’t necessarily believe that bigger means better and look instead for places that we think are extra special: sometimes that means a stunning location, sometimes it means great facilities and sometimes it means an amiable host. Our favourites have all three! If you don’t have your own tent or just don’t fancy taking one all the way to the South of France, you can still enjoy the pleasure of camping by going glamping in the Midi Pyrénées. 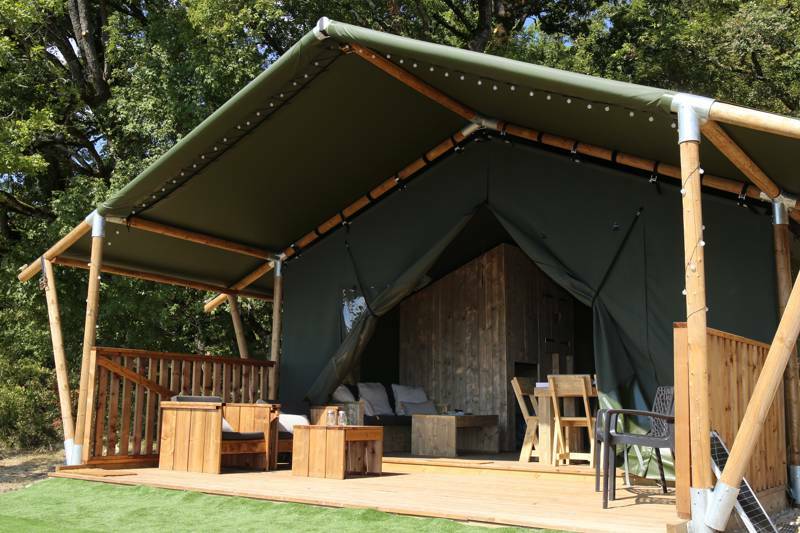 These days there’s a great range of glamping accommodation on a great range of different sites. If you want the pleasure of simple camping without the hassle of pitching a tent, a bell tent, yurt or tipi could be for you. Stylish, spacious and simple, these luxury tents will feel (and look) cool on balmy summer evenings. Safari tents are a mainstay of the French camping scene and also offer the advantage of sleeping under canvas with the added bonus of having separated rooms. These days many are set up for luxury with proper furniture, wooden floors and luxurious fixtures and fittings. There are chalets and log cabins, treehouses, shepherd’s huts, roulottes or gypsy caravans and the range of what’s available is growing all the time as glamping continues to grow in popularity. There’s plenty of glamping accommodation on large mixed camping and glamping sites that exist to cater to the huge numbers of campers who head for the south, or “the Midi” as the French know it, for the summer. Here at Cool Camping we tend to steer clear of holiday park-style accommodation but there are some larger sites that get our full endorsement; after all these sites have been offering glamping since before the word was invented. Pre-erected safari-tent style accommodation and chalets are the mainstays of these type of sites which are particularly good for families. They tend to be sociable places with plenty of facilities and activities for children but that’s not to say kids won’t love the charm of some of the more bijou sites we’ve found in the Midi Pyrénées too. Small sites with just a few luxury tents have a charm all of their own: glampers are made to feel like valued guests, accommodation is more spacious and secluded and the atmosphere is relaxed. Hike up a mountain, mosey up a foothill or take the cable car to the Pic du Midi to appreciate the grandeur of the Pyrénées. If you’re on the eastern side of the region how about a trip into the Massif Central or over the impressive Milau Viaduct – the world’s tallest road bridge some 343 metres above the valley floor. With mountain lakes, waterfalls, lake and river beaches there are plenty of places to enjoy a spot of wild swimming in the Midi Pyrénées – the perfect way to cool down after a long walk or cycle in that south-of-France sunshine. Whether it’s a hike in the mountains, an amble along the Canal du Midi or a stroll along country lanes, walking in the Midi Pyrénées is one of the best ways to see the scenery. The Midi Pyrénées sees its fair share of pilgrims and its holy sites are worth a look: walk part of the famous pilgrimage route the Camino de Santiago (Way of St James), visit Lourdes or the tomb of a revered saint at Rocamadour in Lot. Tucked among trees, overlooking rivers, high on hillsides… France’s châteaux offer a fairytale appeal that never fails to delight. Many are open to tourists and can make a great day out for all ages. The fortified towns of south-west France are a reminder of less cordial relations between the English and French during the Hundred Years War but to modern eyes they are some of the picturesque villages to visit. Most campsites will order croissants in from the local boulangerie so you can enjoy a typical French breakfast and how about popping to the local market to pick up a Toulouse sausage for a campsite barbecue? If you head out for dinner (and you should) try duck or a classic cassoulet. Bergerac, Bordeaux… there are plenty of regional wines to try in the south but you might be tempted to try something stronger in Gers as many of the vineyards are dedicated to producing Armagnac. There’s nothing like a bit of competition to spice things up on holiday and many campsites in France have the facilities for sport with a French twist: anyone for a nightly game of pétanque (boules) or table tennis? By the end of the holiday you may just find yourself planning to build a sandy pétanque pitch in the garden at home! Midi-pyrénées at Campsites in the Midi-pyrénées, Ever wondered about camping in the Midi-Pyrénées? Have a read of our selection of campsites, and you’ll find yourself clicking to book instantly. Tent spots, caravan-friendly campsites, glamping sites, to name but a few. There’s a campsite with your name written on it.